U.S. Navy helicopters take off from the USS Ronald Reagan on Tuesday to provide aid for Japanese earthquake victims. Washington (CNN) -- The ongoing radioactivity releases from damaged nuclear reactors in Japan after last week's historic earthquake are creating "one of the most challenging humanitarian operations ever conducted," according to Cmdr. Jeff Davis, a spokesman for the U.S. Navy's 7th Fleet in Japan. Davis said Tuesday that for the second time, U.S. helicopter crews have been exposed to elevated, albeit low, levels of radiation during flights near Japan's nuclear reactors. In addition, the Navy is moving three incoming ships to a new location because of "radiological and navigation hazards" at their intended destination on the eastern coast of Honshu, according to Davis. Just as in an incident on Sunday, the crew members were stripped of contaminated clothing, scrubbed down with soap and water and tested. In all cases, they no longer tested positive for radiation exposure. On Sunday, tests detected low levels of radioactivity on 17 U.S. Navy helicopter crew members when they returned to the USS Ronald Reagan after conducting disaster relief missions in Japan, the military said Monday. No further contamination was detected after the crew members washed with soap and water, the Navy said. Nevertheless, the U.S. 7th Fleet has temporarily repositioned its ships and planes away from the damaged multi-unit Fukushima nuclear plant. The Navy, however, noted that the most radiation that ship personnel could have received was less than they would receive in a month of exposure to natural radiation sources, such as the rocks, soil and sun. "This will continue to happen," Davis said. He did not know how many personnel tested positive for radiological contamination in the second incident nor what ships they were on. Most of the nine U.S. Navy warships now operating off Japan are involved in helicopter operations. For example, the USS Ronald Reagan Carrier Strike Group flew 29 sorties on Tuesday and delivered 17 tons of supplies, including food, water and blankets. The USS Tortuga is transporting 300 Japan Ground Self Defense Force personnel and 90 vehicles. 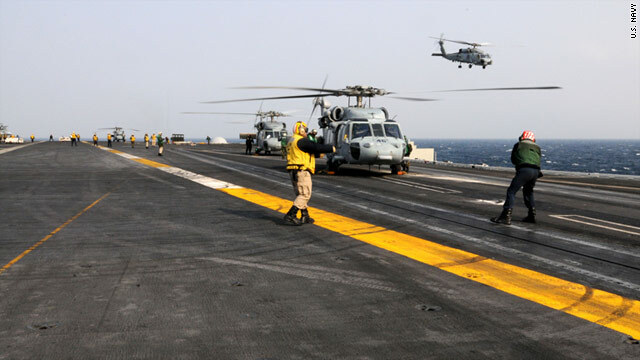 Officials expect that air crew members will continue to be exposed to increased low levels of radiation, so the Navy is telling helicopter crews to keep their sleeves rolled down and keep cabin windows closed when possible. And some air crew members, Davis said, have been given potassium iodide pills. The iodide protects a person's thyroid gland from the effects of radioactivity and can reduce the threat of thyroid cancer. U.S. Navy spokesman Capt. Danny Hernandez said the iodide pills were given as a "precautionary measure only." The U.S. Army's Camp Zama, about 25 miles outside Tokyo, is also taking steps in light of the potential radiation threat. According to messages posted on U.S. Army - Japan's official Facebook page, health officials have been taking "environmental radiation readings every 3 hrs" since Monday. "All readings taken to date have indicated absolutely no health risk to our community," the message read. Nonetheless, the message noted that readings showed "negligible levels" that require the implementation of "mitigating measures," including limiting outdoor activities, leaving windows closed and keeping children inside for playtime and school recess. The radiation exposure appears limited to Navy personnel. Representatives for the Marines and Air Force said they have not seen reports of anyone in their services testing positive for exposure. The Navy has three ships with the 31st Marine Expeditionary Unit on their way to Japan. They are expected to arrive on March 17. Out of concern about radiation, those ships, the USS Essex, USS Harpers Ferry and USS Germantown, will now position in the Sea of Japan on the west coast of Honshu, rather than the east coast, to aid in disaster relief.